Psy’s Gangnam Style in the most watched video in Youtube history with nearly two billion views, but he took 18 days just to reach 10 million views, but a 25-year singing nun has already reached over 23 million hits (and counting) since the video was uploaded five days ago by The Voice Italy and become the latest internet star. 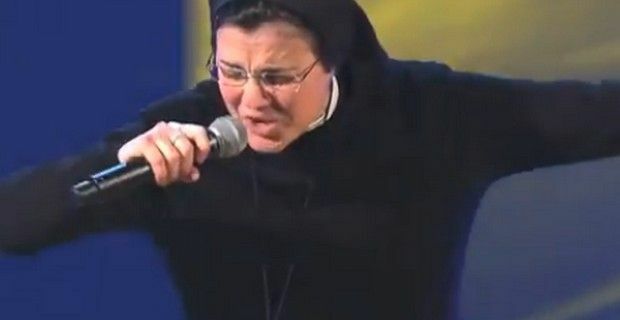 Sister Cristina Scuccia’s performance on the talent show wowed not on the audience, but also left the four judges flabbergasted during her blind audition, with her personal and rocking rendition of Alicia Key’s "No One." The four judges, Raffaella Carrà – one of Italy’s most iconic performer’s, J-Ax, an Italian rapper, Piero Pelù, a Italian rocker and singer Noemi were stunned when they almost immediately turned around to see a nun in her black habit and a large cross necklace belting out the song during the talent show. “I came here because I have a gift, and I want to share that gift,’’ said the singing nun, who belongs to the order of the Ursuline Sisters of the Holy Family. She also said she had been inspired to go on the show by Pope Francis, who “told us to come out of our convents and spread the word of God”. Well Pope Francis hasn’t didn’t call her – yet – but the Vatican’s minister of culture, Cardinal Gianfranco Ravasi (@CardRavasi) tweeted his admiration for the singing nun with, “Ciascuno, secondo il dono ricevuto, lo metta a servizio degli altri (1 Pietro, 4,10) #suorcristina”, which translated means, “Each, according to the gift that he has received, puts it to the service of others (1 Peter 4,10) # suorcristina."